As the metal quartet return to Glasgow after nearly eight years, Metallica kicked off the show with their new album title track "Hardwired" which seen the 13,000 capacity venue echo with heavy metal sounds, the eager fans chanting and clapping their hands as the band ran through the crowd onto the stage, certainly this was the a great opener for the Scottish crowd. The atmosphere in the arena was already starting to build up. A couple songs into set; James Hetfield and co launched into “Seek & Destroy”, an incredible fan favourite from their 1983 debut album. 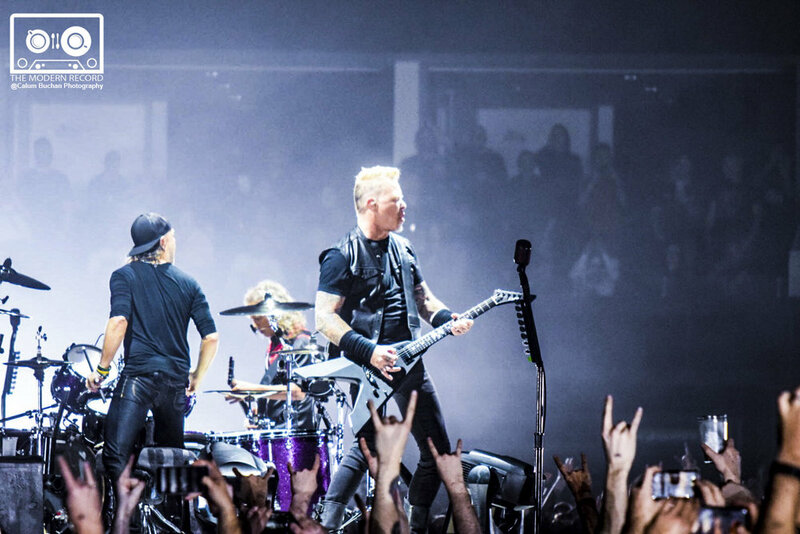 More than eight years later and Glasgow was more than happy to embrace Metallica once more – guitarist Kirk Hammett, drummer Lars Ulrich and bassist Robert Trujillo, along with Hetfield – like old friends bringing the ‘WorldWired’ tour to Scotland. Though this was 11th show of the European Tour, the California-based band hadn’t been back to Glasgow since March 2009, when they performed next door at SEC Campus Hall 4 which was Scotland's formal biggest indoor arena. 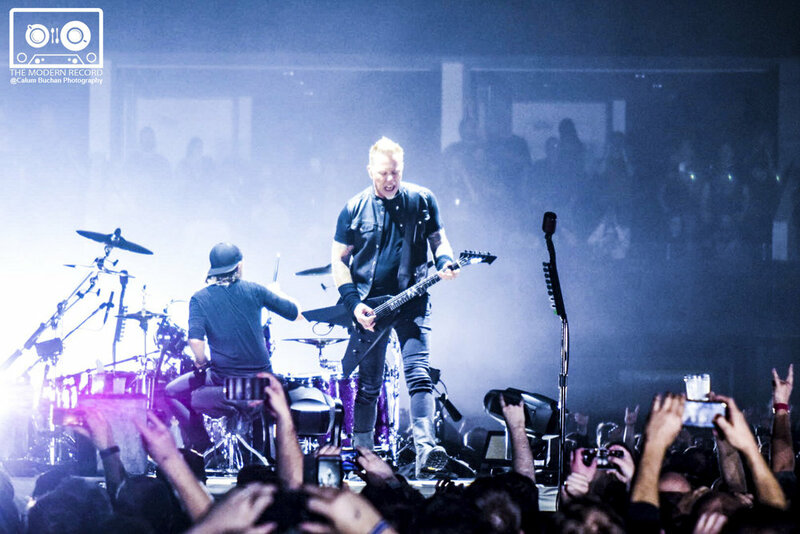 After opening with two songs from November’s “Hardwired … to Self-Destruct,” which sold 1.5 million copies in UK and were awarded with a Plague at The O2 in London this week. 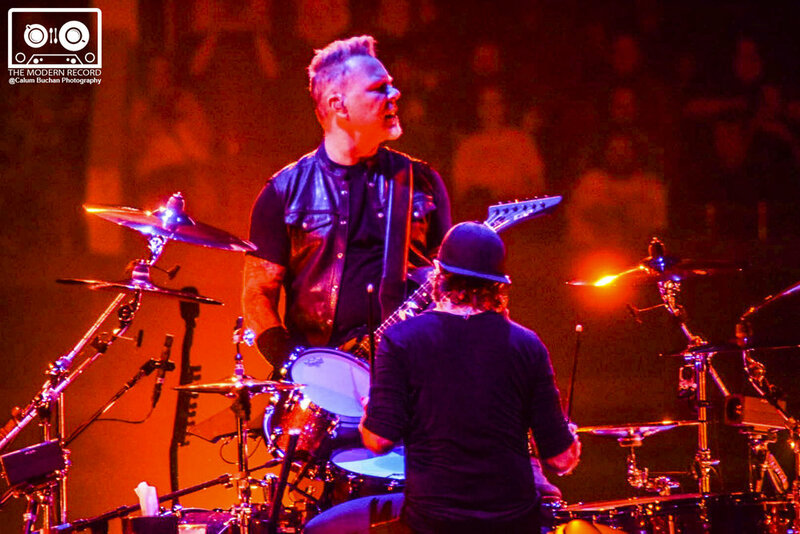 James Hetfield and the band quickly established and further cemented a exceptional performance over two-hours and fifth-teen minutes, an 18-song set which was very impressive. 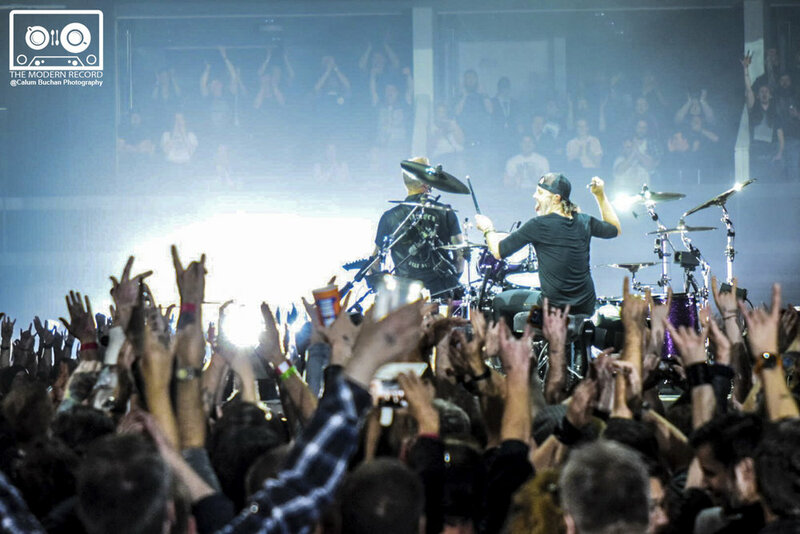 After all these epic years, Metallica are still a serious force playing live. “It feels good to be back in Scotland…. We love being here!” Hetfield shouted out to the crowd during the performance. 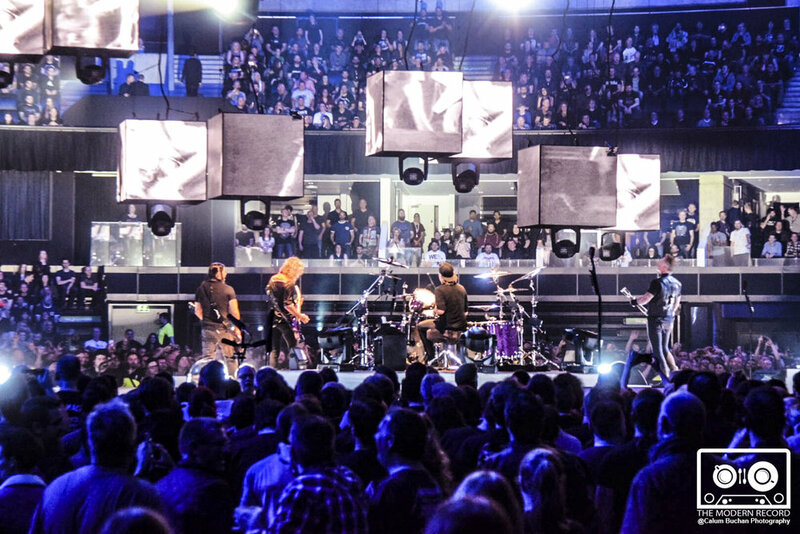 Halfway during the performance Hammett, Ulrich, Trujillo and Hetfield performed ‘Now That We’re Dead’ which included an extended drumming section with all members of the band drumming onto LCD square cubes. as well as getting audience to chant in background. Metallica continued to rip through their back catalogue and performing highlights such as "Welcome Home (Sanitarium)", "For Whom The Bell Tolls", "The Momory Remains" which inspire the to crowd start moshing into circle pits during these songs. The key to Metallica’s image and sound is the remarkable ability to sound ageless. Veteran bands often struggle over time to maintain the intense gusto and accuracy necessary to not look like they’re simply going through the motions, but not Metallica, and not in Scotland on a Thursday evening. 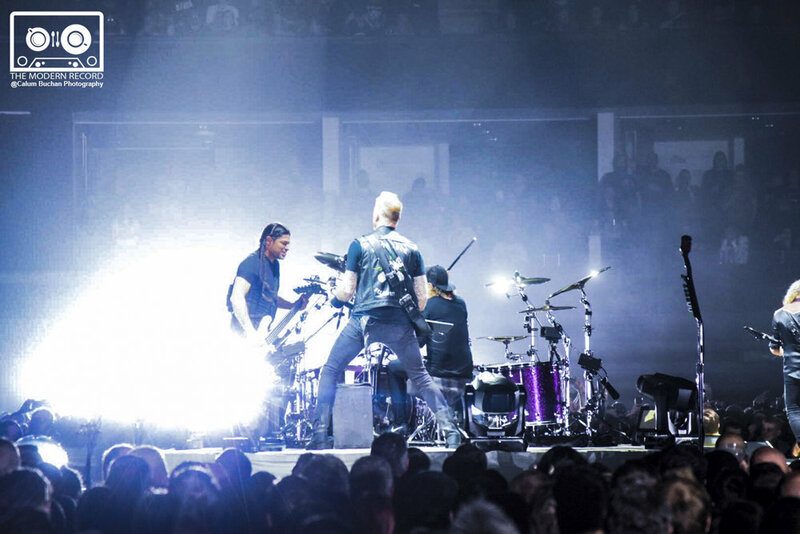 Other highlights included tracks such as a 'Blitzkreig' cover, 'Moth Into Flame' which Hetfield dedicated to the late Amy Winehouse, which seen arena be lit up with lights flying around the stage which looked like drones with lights on them. The highlight of the night was when Hetfield looked into crowd and saw a 10 year old boy at the front barrier and asked what his name was and boy replied saying... "Robert". Robert was standing at barrier with his father and the band were shocked and surprised as they asked the arena "How many people have seen Metallica before?... Put up your hand" and then asked "How many people have not seen Metallica before?.... Put up your hand". Hetfield then replied saying "Welcome to the family" and said those who have seen Metallica before even 100 times were "Stalkers [...] it's great to have you back!". Hetfield also gave mention to all the ladies in arena who made out to see the band and also those who were at barrier and in the mosh pits. Hetfield and the band dedicated 'Sad but True' to Robert's father and exclaimed to the crowd "Are you ready for something heavy!" PHONE PICTURE : METALLICA PERFORMING AT SSE HYDRO, GLASGOW - 26/10/2017 DURING "MOTH INTO FLAME"
Each member of the band made Hetfield's case convincingly. 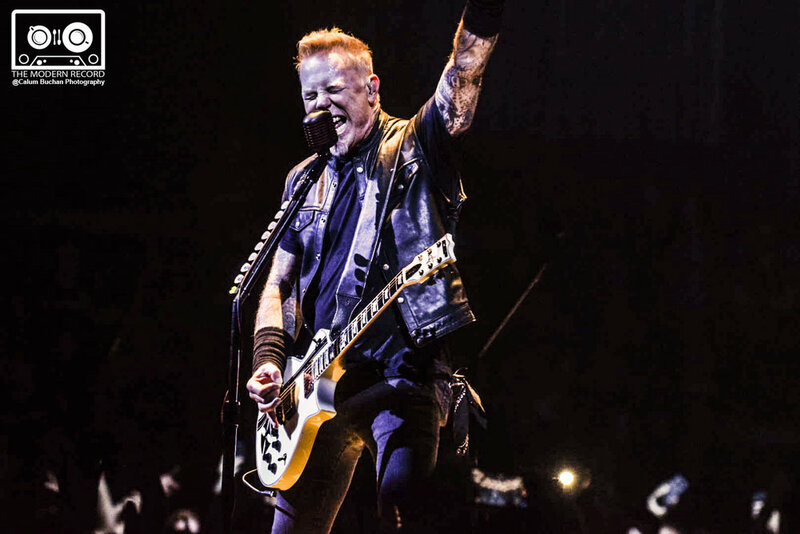 It’s always toughest on the singer, given how vocal chords deteriorate over time with use, but Hetfield’s booming voice rang through the open air with consistent power. 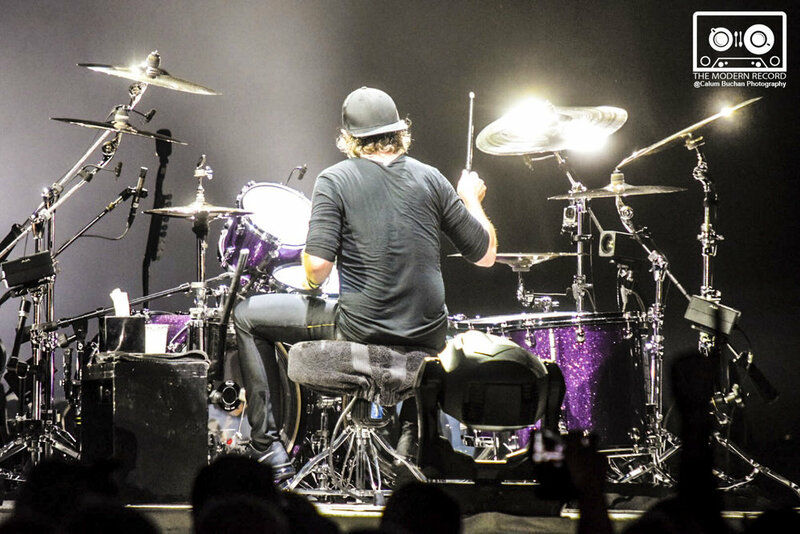 Ulrich’s full-body drumming has never been the star of the show, but it was easy to appreciate his workmanlike, sweat-drenched approach to exhausting drum parts. 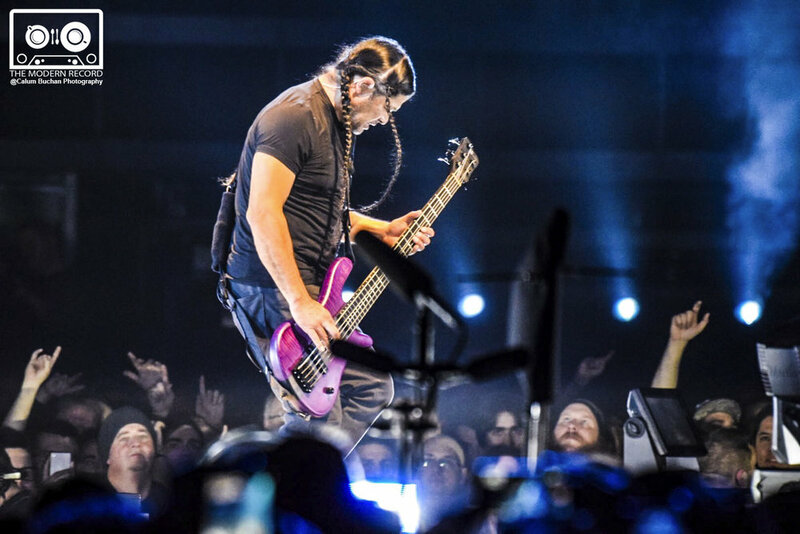 Trujillo, who auditioned and joined the band in 2003, showed why it’s still his gig with finger-picked bass runs that seemed technically impossible. And then there their was Hammett, a virtuoso who reminded the audience why he has inspired countless fans to pick up a guitar. His solos seemed intended to melt the brains of anyone who comes in their contact. 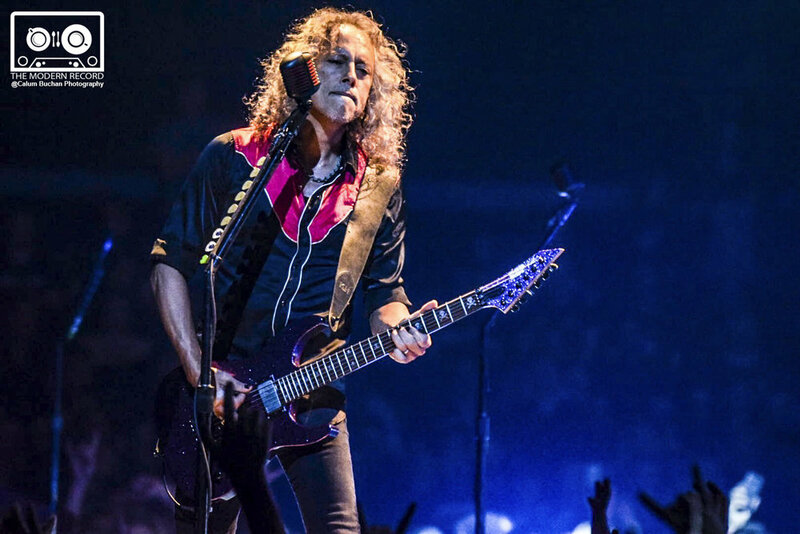 On songs like “Master of Puppets”and the night’s high point “One” Hammett stuffed so many notes into the finger-flying runs, all while bending and pulling the strings with a zen-like ease. It’s enough to elicit awe, anger and jealousy. Like the other members, now all in their 50's, Hammett sported some grey hair. But even though Metallica are ageing, the riffs are certainly not. Huge pyro-flames shot out of the stage, warming the faces of the crowd, while projections appeared on the small LCD square cubs which came down from the ceiling. This display kept tight shots on the band, making the performance feel more intimate. There was some cheesiness too, like the four-member drum circle of “Now That We’re Dead,” but it was fleeting. As fireworks shot out of the stage, “Enter Sandman,” was last track to be performed which made night come to a close, Hetfield gave one last trademark cackle. Ahead of their UK Tour and Glasgow show; Metallica announced that they were reissuing their third album, Master of Puppets on November 10th on their own Blackened Recordings. The album has been remastered for the most advanced sound quality and will be available in various digital and physical configurations. The reissue is available for pre-order beginning today at www.metallica.com where fans can see the full package details and track listing. Those who pre-order the standard album will receive an instant download of “Disposable Heroes (Remastered)”. Those who pre-order the expanded or deluxe editions will receive an instant download of “Disposable Heroes (Remastered)” and “The Thing That Should Not Be (Live at the Aragon Ballroom, Chicago, IL - May 25th, 1986)”.